Editor’s note: This feature originally appeared in the September issue of MReport. The days are long gone when women were trying to break into the workforce. Now, they have their sights set higher—whether on the C-suite or launching women-owned companies. The housing industry has been no exception to this movement, so this month, MReport spoke with several women industry leaders to discuss their views on the changing industry, the challenges they’ve faced during their careers, and the ways they have learned to overcome them on personal and professional levels. As we near the end of the second decade of this new century, we take a look back on what has influenced the progression of women in the business world, and the actionable steps we can take to continue the progression of equality in our society. Debora Aydelotte is COO of Credit Risk Solutions, a provider of outsourced origination and due-diligence services. She told MReport that Dr. Derald Sue, a Columbia University psychology professor, cataloged a taxonomy of microaggressions exerted against female employees. Those microaggressions include what are termed “microinvalidations”—acts endemic in an environment that works to exclude or ignore individuals’ or groups’ contributions. According to Dr. Sue’s research, microinvalidations range from interrupting women who are speaking during meetings to more egregious acts, such as women being passed over for promotions despite demonstrating every bit of the competency and professionalism of their male colleagues. “Another issue is the myth of meritocracy,” Aydelotte said. “We want to believe that everyone has an equal chance of success. But if it were true, why is there so little diversity at the higher levels of companies?” asked Aydelotte. Forward-thinking companies aren’t waiting for changes in the culture to seep into the business arena—they are aggressively pursuing ways to efficiently and effectively integrate and empower their female employees. Some of the ways companies are working to tackle these problems include: 1) diversity and inclusion assessments; 2) employee/business resource groups; 3) formal and informal mentoring, career development, and recognition programs; 4) review processes that encourage vocalization of professional needs, including pay equity; 5) support of expanded industry and community participation among women, including at conferences, summits, and other events; and 6) the broadcasting of women employees’ achievements. Lori Eshoo, President, and CEO of National Tax Search, LLC, says that her organization strives to include diversity at every level of management. Eshoo states that this promotes a healthy work environment that values every- one’s contributions and creates a fluid team. Mentoring Matters Mentoring, both formal and informal, is popular among women seeking enhanced inte- gration, as are career develop- ment and recognition programs. Aydelotte studied management philosophies and techniques, which strengthened her approach to mentoring. “I dove deep into the writings and research of Dr. Edward Demming and Peter Drucker and was able to apply much of it, from a process mechanics approach to the mortgage process,” said Aydelotte. Millard explained that her company’s mentoring program appeals to those interested in being either a mentor or a mentee. “The program matches ‘best-fit’ pairs and is structured to incorporate both informal and formal mentoring opportunities,” Millard said. “As an example, our Seasoned Professionals and Young Professionals ERGs recently hosted a discussion panel of company leaders called ‘Advice to My Younger Self,’” Millard explained. The discussion, which was open to all employees, was followed by a networking session. Companies know let their employees know they are listening when they hold review processes designed to encourage employee input. Expanding employees’ the participation horizons in their industry and community is another effective means companies are utilizing to integrate women effectively. 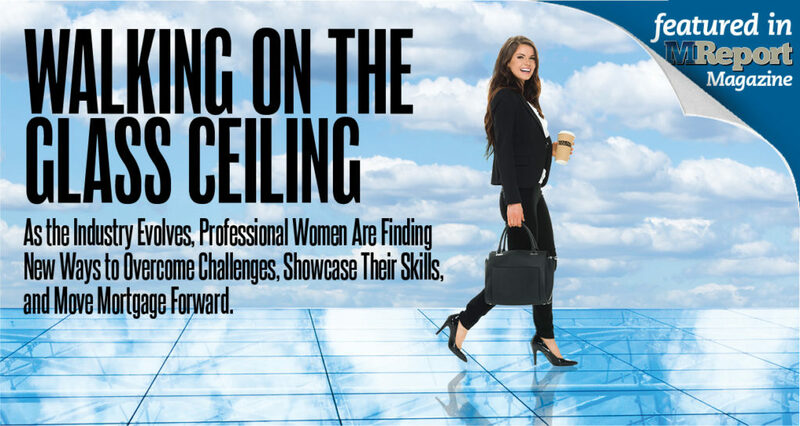 Companies are actively sponsoring conferences, summits, and other events designed to promote women’s advancement within the mortgage industry. “Arch MI plans to present the Executive Women’s Conference every two years,” Millard added. Eshoo stressed the importance of women involving themselves in professional and community organizations and using these opportunities such as forums and panel discussions to network with other women and promote and encourage women in business. Goal setting is part and parcel of successful development. “Women should consider how they help their organizations conduct strategic planning, such as assessing industry horizons and setting strategy and apply the same process to their careers,” Aydelotte said. “On a regular basis, you should determine your personal and professional goals for the next few years and create a strategy and action plan to achieve them. Ask yourself at the end of every week, ‘What did I do to get closer to my goals?’"